This image shows the composite ITS image of the nucleus with a grid or coordinate system laid over it. 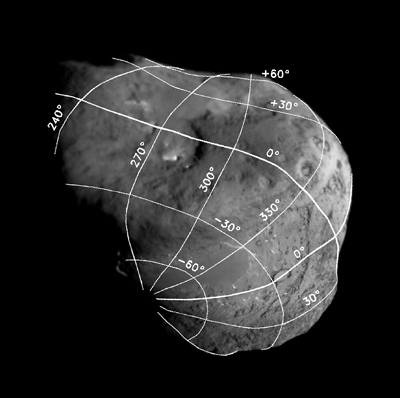 The grid helps the science team reference features on the surface. The positive pole is over the horizon at upper right and the longitudes increase according to the right hand rule as defined by the IAU convention. The prime meridian was defined to go through the center of the well-defined crater above the impact site. It is a clear, easily identified feature that can be seen in most of our images, so it makes a good reference point.